responsibility for all the buildings and assets. Has the headteacher made you fully aware of all these in detail? Are you confident that you, as Governors, have the expertise and time to manage these new responsibilities adequately? government created quango run from London. Will the remoteness of this supervision and control be an advantage or a disadvantage? the years, there will be different Secretaries of State with different attitudes to education, are you happy to accept that the school’s future will depend on an individual? d. The Act as passed on July 27th, 2010, requires you to undertake ‘appropriate consultation’. potential advantages of becoming an academy but also of the potential pitfalls? country’s financial status cannot tolerate double funding and wastefulness. short term but going forward into subsequent years? Given that you will not be able to call on the LA to rescue you in the event of emergencies, there is a need for substantial contingency funding in reserves. specific part of the Business Plan? The incoming coalition government has offered outstanding schools the chance to convert to becoming an academy. This has been presented as an exciting innovation. now and the long term? the rest of the Local Authority? Have you evaluated how your actions might affect your professional relationships and shared ways of working with colleagues in other schools? You will have the freedom to change the length of the school day or the length of the school year. 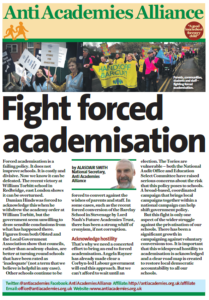 Have you considered the difficulties that would cause for teachers with children in other LAs or non-academies? If you have school buses, the LA remains responsible for home to school transport but any extra costs caused by changing the school day will be charged as an extra by the LA. Have you factored this into your business plan? without reference to national pay scales, according to circumstances determined by the leadership of the school. Has the significance of this been made clear to you by the Head and Governors? to yours but at a higher pay rate. How could this impact on relationships in the school between leadership and staff and between individual members of staff? national agreements, your union/association representatives will need to deal directly with the Head and Governors. What attitude will the Head and Governors take to your union/association membership? Will they discuss matters with your union/association representatives? longer be available to the LA but will come to your school. Have you been made aware of this? Do you think this might prejudice good relations with teachers in other schools? e. As an academy, you will be freed from the national curriculum but your pupils will still be tested according to the national regulations. Do you welcome this greater freedom? Have the possible implications in terms of workload been made clear to you? legislation to undertake ‘appropriate consultation’. Did you respond or ask any questions? Was a meeting called to give you a chance to find out more? Do you think that you fully understand what this decision means? Are you taking the Head’s recommendation on trust? budget. These needs may arise for your children or other pupils in your school. What guarantees have you been given that the extra help will be bought in as required, at an equal or superior service level to the help already provided by the LA? What method of accountability will be provided by the new Academy that best value is always achieved when buying in these services? are possibly depriving those pupils in other schools that may need it. Has this been flagged up to you as a possible local impact of gaining academy status? London and the Secretary of State. Your local councillor will not be in a position to help you, nor will officers from the Local Authority. Are you satisfied with this procedure as a way of sorting out problems? pupils in each phase. The top-up grant is called the LACSEG grant (Local Authority Central Spend Equivalent Grant). The LACSEG top-up grants in Cambridgeshire for 2010-2011 are £337 per pupil for primary and £318 per pupil for secondary. that they have already given to LAs. £117,600 from LA central funds. ii. One of the largest primary schools with 461 pupils will receive £155,357 and will remove £46,561 from LA central funds. 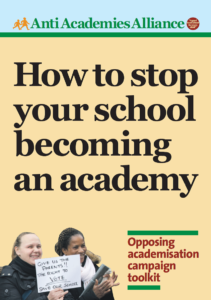 The Government is clear that becoming an Academy should not bring about a financial advantage or disadvantage to a school. It is not yet clear how the YPLA will calculate financial advantage or disadvantage and what steps it will take to rectify any discrepancies. f. What might Academies spend their extra money on? 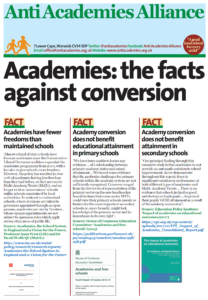 Academy decides it does not need to buy in school support or school improvement advice (as it is already deemed ‘outstanding’), it will undoubtedly have a net financial bonus..
enable it to attract more pupils, thereby increasing its net extra income further and reducing the cost-effectiveness of neighbouring schools. residual LA schools and pupils of access to a specialist service they need and for which they will not have the funds to buy in. for those who need it most? the benefit of those who benefit. funding, regulating and monitoring is already in place in LAs? Where will the extra money for this come from? this development when they already had many challenges to face in a time of austerity. Is the real gain for pupils sufficiently significant to justify all this activity? This entry was posted in Resources and tagged Consultation, Governors. Bookmark the permalink.